I was on another multi-tasking mission to Spain last November, and high on my list was attending the San Sebastián Gastronomika 2010 chefs conference, where several New York City food folk—Thomas Keller, Daniel Boulud, David Bouley, Drew Nieporent, Anthony Bourdain, Colman Andrews, David Chang, and Wylie Dufresne—would be appearing. Especially appealing was the prospect of seeing what the conference organizer, Grup GSR, run by the Catalan dynamo Roser Torras, had up its sleeves for the annual event. Roser Torras and Drew Nieporent at Elkano Restaurant, San Sebastián Gastronomika 2010. Photograph by Gerry Dawes©2010. Contact gerrydawes@aol.com. Nieporent and I planned to meet in Bilbao Saturday evening, November 20, the night before we were due at San Sebastián Gastronomika. I was to get us a dinner reservation at the legendary Asador (grill-house) Etxebarri, southeast of Bilbao. 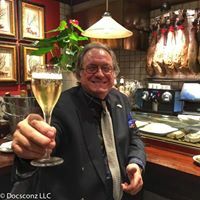 I called Victor Arguinzoniz, the now-renowned owner/grillmeister of Etxebarri, called by some the best restaurant in northern Spain, and heard, “Sorry, but I don’t have a single seat”—not even for Nieporent, the famoso restaurateur. 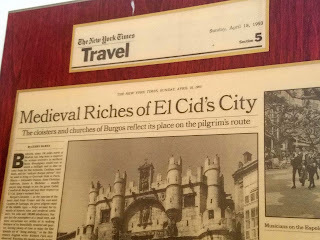 My fallback was Elkano, which has been called the best fish restaurant in the world, located in the magical fishing village of Getaria, near San Sebastián. “Elkano is closed for vacation,” a voice message said. Fallback position numero dos was Kaia, also in Getaria and also famous for whole wild grilled turbot. Whole rodaballo (turbot) grilling at Kaia, Getaria. At Kaia, we had house-cured anchoas (anchovies) and excellent txangurro (a classic Basque dish of centollo, or spider crabmeat, sautéed with leeks and garlic, spiked with brandy, put back in the shell and browned under a broiler). Our main course was whole wild rodaballo (turbot) grilled over wood coals and filleted at the table, a glorious dish for which Getaria is justly famous. We accompanied the anchoas and txangurro with Getariako Txakolina, Getaria’s slightly pétillant “green wine,” and with the rodaballo we had a still impeccable Monte Real Reserva 1970 at a laughably reasonable price. After dinner, Nieporent’s driver appeared and whisked him off to San Sebastián. Because my conference lodgings were unavailable until the next day, I had booked a room in Getaria at the charming Pension Getariano, just across the street from Elkano restaurant. Sunday evening, after a press conference featuring a panel of Basque star chefs—Juan Mari Arzak, Pedro Subijana, Martín Berasategui, Andoni Aduriz, and Hilario Arbelaitz—16 emerging Basque country talents prepared some wonderful degustaciòn plates for a reception. 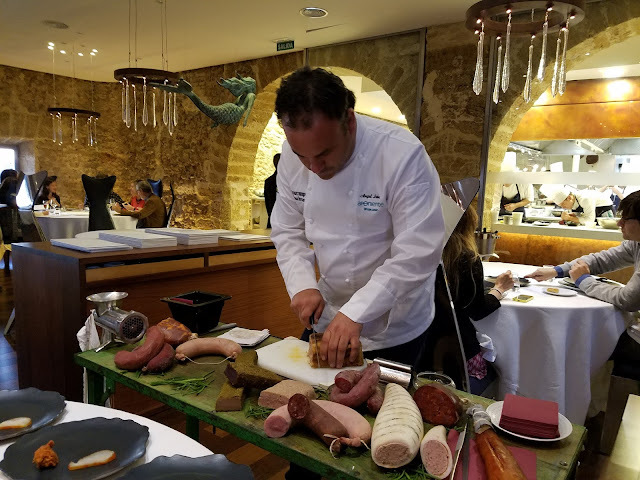 I saw Boulud and Brazilian journalist Alexandra Forbes watching as chef Ramón Piñeiro from the Frank Gehry–designed Marqués de Riscal hotel restaurant in La Rioja Alavesa put the finishing touches on his soufflé of Idiazabal cheese with organic olive oil, herbs, and citrus. Huevo frito con patatas, a still liquid egg yolk wrapped in thin strips of potato, then flash-fried, from chef Beñat Ormaetxea of Jauregibarria was perhaps the evening’s top mouthful. 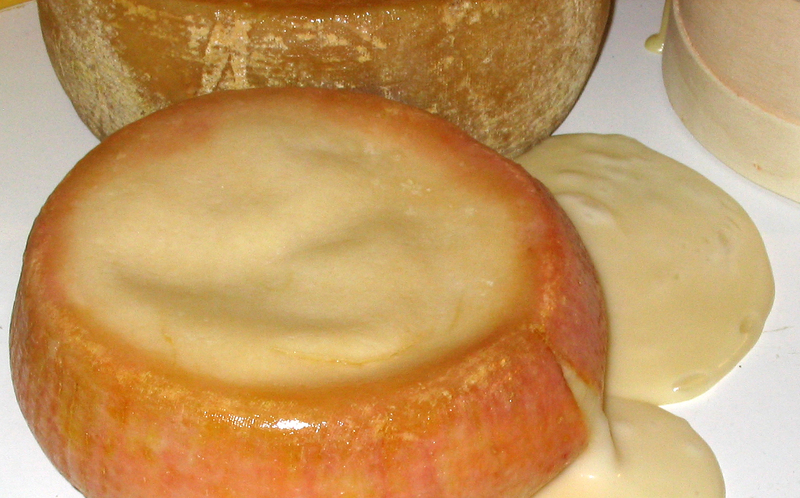 restaurant put the finishing touches on his Souffle of Idiazabal cheese. San Sebastián Gastronomika took place during Thanksgiving week, with the contingent from New York appearing for their big day on Tuesday, November 23. Bouley, Boulud, Bourdain, Chang, Dufresne, and Nieporent all played to large appreciative audiences. Andrews was there for the presentation of his book, Ferran: The Inside Story of El Bulli and the Man Who Reinvented Food. Also drawing large followings were the contingent of Spanish superstar chefs: Ferran Adrià, Joan Roca, Carme Ruscalleda, and Christian Escribà from Catalonia; San Sebastián home-grown estrellas such as Arzak, Subijana, Berasategui, Aduriz, and Arbelaitz (12 Michelin stars in total); Italian chef Massimo Bottura (Osteria Francescana, Modena); and Australian Neil Perry (Rockpool Bar & Grill, Melbourne). A conference highlight was the homenaje (homage) by all his fellow Basque chefs to Spanish television’s Karlos Arguiñano, who is probably more famous here than Adrià. 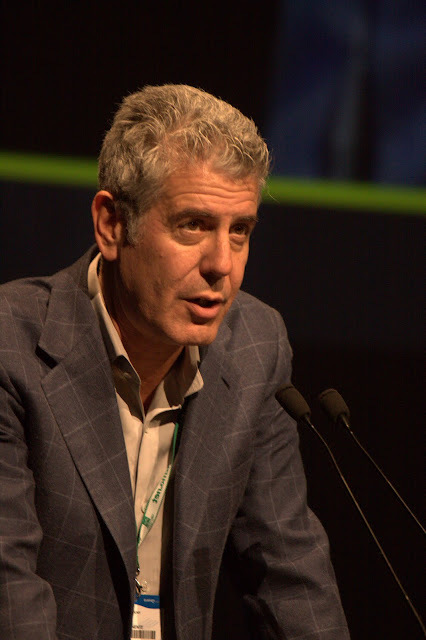 Anthony Bourdain presenting at San Sebastián Gastronomika 2010. Interwoven between the daily presentations was the star-studded scene at the Joselito Ibérico stand, where Spain’s ham king, José Gómez, and his crew of ham slicers served some of the world’s best air-cured hams, chorizo, lomo (loin), and salchichón (salami) trucked over from his aging plant in Guijuelo (Salamanca). Gómez likes to serve top Spanish red wines and French Champagne with his Ibérico pig products. 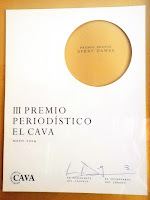 It was not unusual to see the likes of Keller, Boulud, Adriá, and Arzak sitting together, toasting with flutes of bubbly while munching on Joselito’s stellar jamón Ibérico de bellota—air-cured hams from the acorn-fattened pata negra (black foot) breed of Iberian hogs. José Gómez, Joselito the Jamón king at San Sebastián Gastronomika. To honor the New York presenters, Christian Escribà, the legendary Barcelona pastelero-chocolatero (pastry and chocolates) maestro, rolled on stage his large chocolate and marzipan creation of the New York City skyline with marzipan figures of the New Yorkers with their initials on their chef’s jackets. Andrews’ figure held a tiny copy of his book Ferran. “I really felt special, humbled, and honored to have Escribà’s amazing, extraordinarily meticulous New York piece presented to us,” Keller said. Christian Escribà at San Sebastián Gastronomika 2010. New York contingent posing with Christian Escribà's sensational pastry-and-chocolate creation of New York, New York at San Sebastián Gastronomika 2010. Boulud, Nieporent, Dufresne, Andrews, Chang, Keller & Bourdain. Photograph by Gerry Dawes©2010. Contact gerrydawes@aol.com. Boulud cooked his famous foie gras/short rib/beef burgers on stage and passed out at least 200 portions to an appreciative audience in the VIP section of the 1,800 seat Kursaal Auditorium. Keller’s cooking demonstration was “certainly a departure. Everybody at San Sebastián Gastronomika 2010 was doing demonstrations based on formulas and techniques,” he said. “Rather than trying to intellectualize or formulate something, my Per Se sous chef David Breeden and I went to La Bretxa market in the old quarter, and from ingredients available that morning, we just spontaneously prepared some beautiful dishes.” Beautiful indeed: citrus-cured mackerel with cipollini and compressed sour apples; uni with avocado, orange suprêmes, and arugula; Idiazabal with artichokes cooked sous-vide with compressed Paris mushrooms and watercress. Three-star Michelin Chefs Juan Mari Arzak & Thomas Keller at San Sebastián Gastronomika 2010. 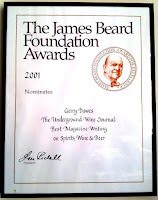 I first took Thomas Keller to Arzak in 1990, before he opened The French Laundry. As the conference broke for lunch, Arzak hailed me: “Gerry Adams! [that’s what he calls me], you have a rental car, no? I got a reservation at Etxebarri!” (See Departures profile of Etxebarri.) I jumped at the chance to have lunch there. It was after 3:30 when I pulled into Etxebarri’s parking lot in the Basque hamlet of Axpe. I hoped to photograph Arguinzoniz working at his specially designed grills, but I was informed by the woman running Etxebarri’s dining room that he didn’t want the distraction of photographers during service. Arguinzoniz’s style of grilling is a precise discipline that requires his full attention, especially when he performs such miracles as smoking caviar in a self-designed grill pan with microscopically fine mesh laser-bored openings that allow smoke to come through while holding in moisture. Victor Arguinzoniz at the grills he designed himself at Etxebarri. I opted for the shorter tasting menu: smoked house-made mozzarella perched on a single slice of eggplant; a perfect house-cured and seasoned anchoa on a thin strip of grilled bread soaked with olive oil; exquisite pieces of nécora crab grilled in the shell; a pair each of lightly grilled, rosy pink gambas de Palamós (highly prized shrimp from the Costa Brava); a pair of lightly smoky grilled oysters with oyster liquor espuma (foam), perched on a slice of pickled eggplant; and grilled becada (woodcock) with its detached head and beak presiding over an assortment of grilled fall vegetables, a chestnut, and carrot puree. My only caveat was the repetition of smoke in every dish. Necora crab a la parilla at Etxebarrr. The meal at Etxebarri was yet another Spanish Basque triumph of exceptional product sourcing married to simple, but exceptionally refined, techniques, which, in the best places, trumps cocina de vanguardia sleights-of-hand nearly every time. In the hands of experienced maestros at Extebarri, Elkano, and Kaia, such dishes, because of their exquisite simplicity and pure flavors, remain etched in memory long after many of the cocina de vanguardia pyrotechnics evaporate like an espuma in the dessert. Perhaps that’s why so many Spanish vanguardia chefs have opened modernized traditional tapas bars in the past few years. Fortunately, dinners begin late in Spain, which allowed a couple of hours after Etxebarri before dinner at Elkano (click to see Departures profile on Elkano, the third gastronomic thoroughbred in my trifecta. I arrived to find Elkano’s father-and-son owners, Pedro and Aitor Arregui, and their longtime grill chef, Luis Mari Manterola, sweating “la gota gorda” (the big drop) at the prospects of serving 130 people, including the culinary heavyweights attending the conference. Luís Mari Manterola grilling turbot at Elkano. 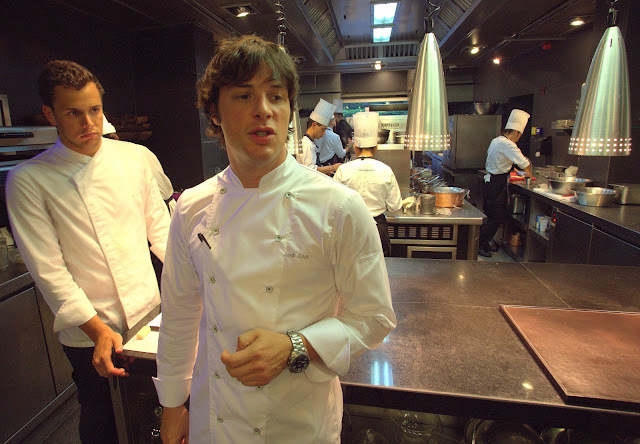 San Sebastián Gastronomika 2010. From previous meals at Elkano, I had no doubts that they would impress even this crowd. And they did, serving us superb almejas (clams); a tartare of chipirón (small squid) with sea urchin and trails of chipirón ink sauce (a Getaria speciality); two preparations of kokotxas (hake glands), one grilled, the other battered and deep-fried, both ethereal; small samplings of fat sea-tasting percebes (goose barnacles); wood charcoal grilled langosta (lobster); and whole wild rodaballo (turbot) filleted at the table, all accompanied by light, refreshing small producer Txakolis from Getaria. We finished by dipping into whole, wonderfully oozing Torta del Casar sheep’s milk cheeses from Extremadura and texturas de manzana reineta a la parrilla, a sensational grilled apple dessert. Elkano owner Pedro Arregui, El Maestro, with two of the whole grilled rodaballo (turbot). San Sebastián Gastronomika 2010. Photograph by Gerry Dawes©2010. Contact gerrydawes@aol.com. Wylie Dufresne and David Chang at the Elkano dinner. San Sebastián Gastronomika 2010. Painting of breakfast churros being made in times past at La Malagueña, one of the great breakfast stops for tejeringos, a type of churro made famous in Málaga. 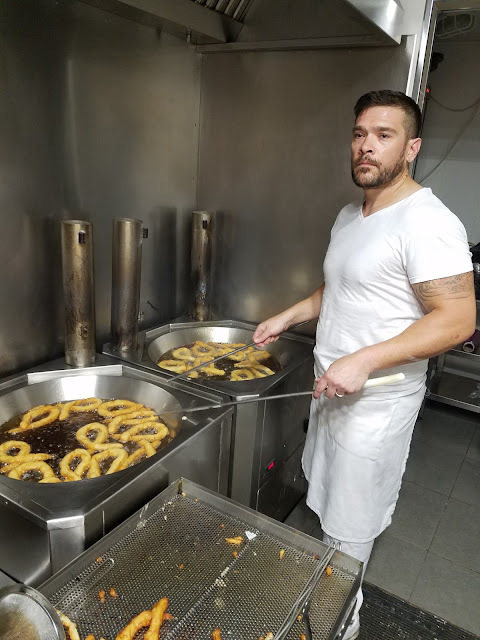 Churros cook Pablo at La Malagueña, one of the old quarter's great breakfast stops, making tejeringos, a type of locally famous in Málaga. Photo by Gerry Dawes©2017. 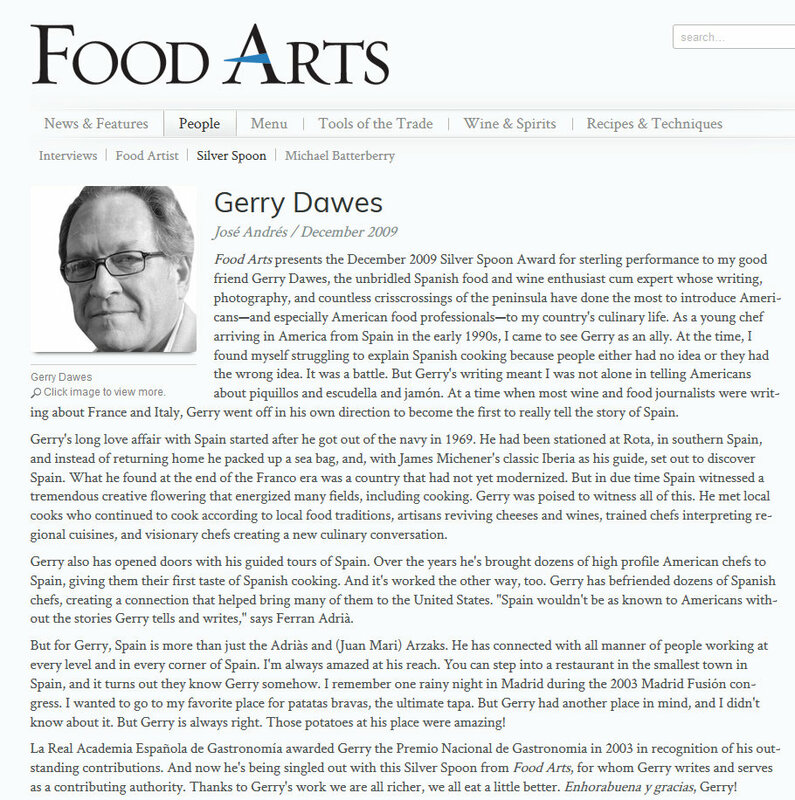 Until a trip in early May to attend the Málaga Gastronomy Festival, I was truly ignorant about Málaga and its unique culinary traditions. For more than forty years I have wandered Spain, incessantly crisscrossing the country from top to bottom. I have left few stones unturned. Except for places in the Catalan and Aragonese Pyrenees in northeastern Spain, Cartagena and much of Murcia province, a few outposts along the Portuguese border such as Cuidad Rodrigo, the city of Huelva in Andalucía and the farthest reaches of the northern coast of Galicia, I have pretty much covered the country and have visited many areas dozens of times. It would seem that I would have delved as deeply into the major Andalucian city of Málaga--birthplace of Pablo Picasso and hometown of Antonio Banderas, who lives there now no less--as I have the other jewel cities of the South: Sevilla, Córdoba, Granada and Cádiz. As I was to discover on this trip, I would regret that I had not made more time for Málaga, something I plan to remedy as soon as possible. I even lived for nearly three years in the province of Málaga 35 kilometers west of the city. 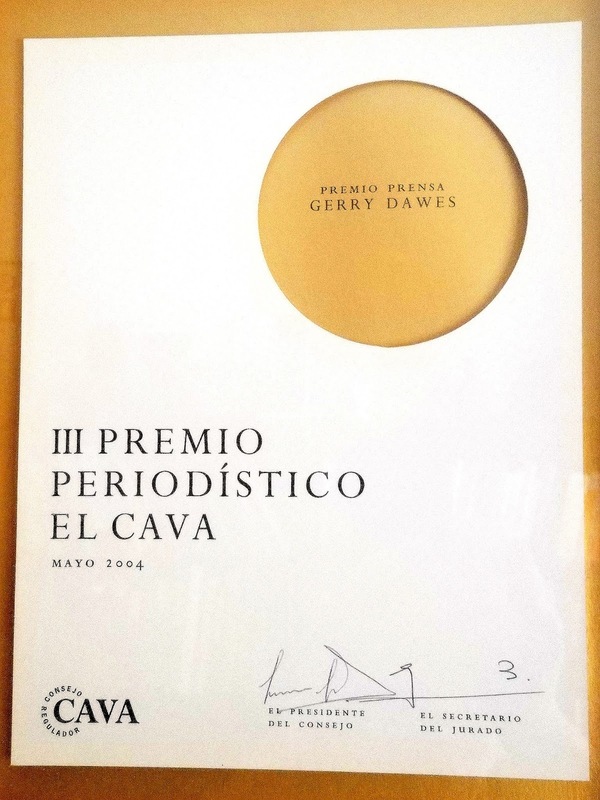 My late former wife Diana and I ran The Dawes Gallery for Contemporary Art in Mijas, a picturesque tranquilo ex-patriate artist’s village perched high above the Costa del Sol. But we seldom visited the provincial capital of Málaga itself, except on infrequent missions to deal with filing documents with the exasperating Spanish bureaucracy. Even back then in the mid 1970s, traffic seemed to be a problem, so we generally avoided Málaga city. In retrospect, when we were living in Andalucía, the several pleasure outings we made to Málaga were memorable, including a few luncheons at the legendary seafood restaurant Antonio Martín (now revived as El Merendero de Antonio Martín), where my wife Diana and I had magical times dining at open-air tables right along the seawall. We had a lovely lunch, invited by a sadly long-forgotten benefactor, at the rooftop restaurant of the Hotel Málaga Palacios overlooking the harbor and we spent a night at the Parador de Málaga Gibralfaro on its spectacular perch high above the city. Málaga harbor from the rooftop terrace restaurant of the Hotel AC Málaga Palacios. A couple of times, we ventured just east of Málaga’s harbor for lunch at one of the famous chiringuitos (way casual beach restaurants) on the Pedregalejo fishermen’s beach. There were chanquetes (tiny whitebait crisply fried) and sardinas al espeto, half a dozen sardines stuck on cane spike espetos (spits) and grilled over wood fires right on the beach (now the government has decreed that these grill fires cannot be on the beach, instead they are done in sand-and-pebble filled fishermen’s dinghies in front of each restaurant). And there were particularly memorable non-Spanish dinners at Le Pic Nic, a restaurant run by a very eccentric middle-aged French couple, she at the stoves in her slip cooking marvelous old-fashioned French country food such as rabbit in a cream sauce while her husband waited the tables and dispensed the vino. Sardinas and whole fish cooking al espeto, on cane spits, over live wood coals at Las Acacias chiringuito on the Pedregalejo Beach in Málaga. Photo by Gerry Dawes©2017. Ironically, another memorable night took place on an American aircraft carrier anchored in Málaga harbor. We had somehow met a U. S. Navy Captain pilot, with whom I had hit it off, since I had flown off aircraft carriers on Navy aircraft chasing the Soviet fleet around the Mediterranean as a Russian linguist enlisted man. I invited the Captain to our house in Mijas for paella and he asked if he could bring a friend, an Iranian pilot training with American forces (Iran and the U. S. were still friendly then). We passed an enjoyable afternoon with the two fliers and the Iranian pilot remarked that our paella reminded him of some Persian rice dishes in Iran. The Navy Captain invited us to have dinner with him in the Admiral’s stateroom on board the aircraft carrier John F. Kennedy in Málaga harbor. Ten years ago, one of the shore stops for a cruise ship on which I was lecturing about Spanish gastronomy, cheeses and wine docked in Málaga. I went ashore like a tourist and photographed the wonderful Atarazanas Market, which is in a 19th-century iron-frame building fronted by a large 14th-century Moorish gate that once opened on to the harbor--but now due to centuries of development and landfill is a few blocks inside the city. The wonderful Atarazanas Market, which is in a 19th-century iron-frame building fronted by a large 14th-century Moorish gate. Photo by Gerry Dawes©2006. Atarazanas Market, which is in a 19th century iron-frame building fronted by a large 14th-century Moorish gate. Photo by Gerry Dawes©2006. Olive seller, Mercado de Atarazanas, Málaga. Photo by Gerry Dawes©2006. On my shore prowl, for the first time, I visited the evocative Moorish fortress, the Alcazaba, which begins at the edge of the old quarter near the restored ruins of the Roman theater. And I visited a few bars and restaurants, the most memorable of which were the venerable 19th' Century Málaga wine-dispensing bodega Antigua Casa de Guardia and the emblematic flamenco-and-bullfighter-centric restaurant in the old quarter near Málaga’s Cathedral, El Chinitas, which took its name from the 19th-centrury Málaga café cantante-teatro Chinitas (located nearby) made famous by Federico García Lorca and said to be the oldest flamenco café in Spain. El Chinitas, Málaga. Photo by Gerry Dawes©2006. Painting of sailors on shore leave at La Antigua Casa de Guardia, Málaga. Photo by Gerry Dawes©2006. La Antigua Casa de Guardia, Málaga. Photo by Gerry Dawes©2006. All I saw in my short cruise ship shore excursion was promising. 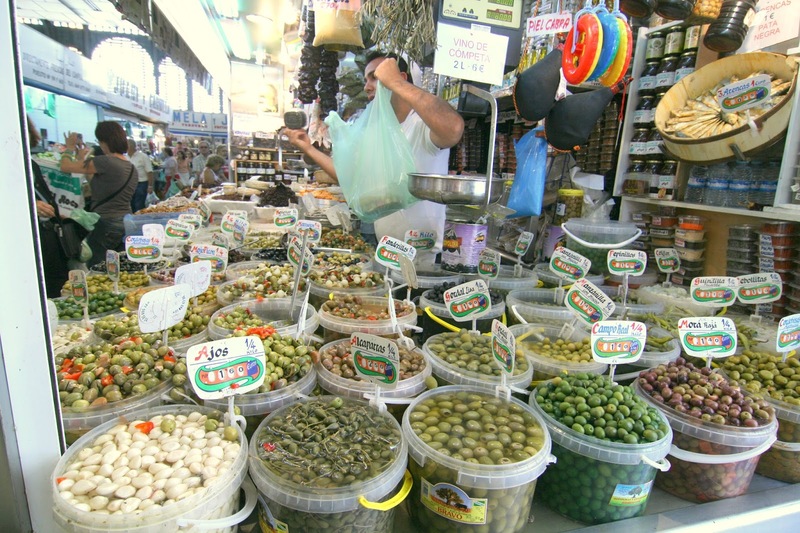 I put Málaga on my list for a re-visit, but my some fifty wine-and-gastronomy travels and personal visits to Spain over the past decade were mostly in northern Spain, along the Mediterranean from Barcelona to Alicante or in the western part of Andalucia. Except for a return visit to Mijas to visit old friends, Málaga did not tempt me enough to make time in my schedule for a follow-up visit. Málaga Gastronomy Festival 2017 poster. I will not try to claim that Málaga’s culinary scene rivals Barcelona, San Sebastián or Madrid, but I found that not only were there some good authentic regional restaurants (augmented by the classic chiringuitos, those legendary beach-front joints specializing in wood-fire grilled sardines and whole fish); funky, wonderful old-time tapas bars; churros and chocolate emporiums; and the great Atarazanas market and its market bars, there were several promising modern cuisine restaurants. And there are more than enough tourist attractions and ambience to warrant a serious visit and even an extended stay to this ancient, yet simultaneously modern, international and vibrant quintessential Mediterranean city. 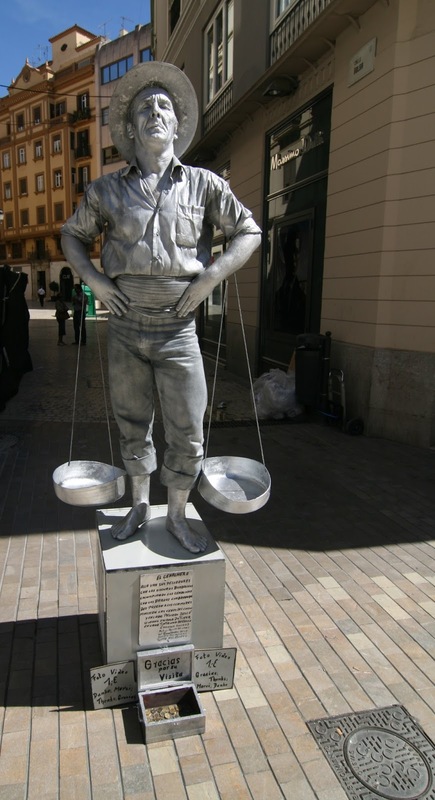 Human statue of El Cenachero on Calle Larios, one of the most famous streets in Málaga. Cenacheros were men who used to sell boquerones and sardines that they brought up in cenachos (baskets) from the fishing boats in the port, and sell them in the streets (and in villages, sometimes miles away from the sea). Photo by Gerry Dawes©2006. First off, it helps to separate Málaga city from the storied and somewhat notorious Costa del Sol, famous for its beaches, booze and high-rise vacation package tour hotels and apartments blocking views of the Mediterranean for miles. Much of the Costa del Sol caters to mass tourism, is attractive as a retirees’ haven and is home to Marbella, where I also once lived before it became the full-bore, high-rent magnet for well-heeled, but not well-behaved, nuevo Euro-ricos, Spanish celebrities, aristocrats, wealthy yacht owners, corrupt politicians (a redundancy these days) and those attracted to that scene which might be likened to a mini-Las Vegas, but by the sea and without the surfeit of casinos. Most people who fly into Málaga airport, located between Málaga and Torremolinos, upon landing take an immediate right turn and head west for Torremolinos, Fuengirola, Marbella, Estepona and on down to Sotogrande, the famous golf resort in neighboring Cádiz province. And, though some of them may make a perfunctory day trip to Málaga for a visit to the Picasso Museum (Picasso was born in Málaga in 1881 and lived there for the first ten years of his life), but most visitors to the Costa del Sol remain scattered throughout the beaches town along the coast. Although there are plenty of foreign visitors, many of them off cruise ships for the day, Málaga has managed to maintain its very singular Andalucian character. This ancient city that the Phoenicians knew as Malaka now deserves to break into the ranks of the not-to-be missed Andalucian classics--Sevilla, Granada and Córdoba--and become the fourth must-see city on the Andalucian circuit. And, like, those other three cities, the restaurants, tapas bars and shopping in Málaga are intertwined with central city sites of real tourist merit such as the restored Roman theater, the 8th-century Alcazaba fortress, the 14th-century Moorish doorway to the wonderful Ataranzanas market, the 16th-18th century Italian Renaissance-style Cathedral (called La Manquita, the one-armed lady, because the builders ran out of money to finish the second bell tower meant to complement the existing one) and the life-size bronze statue of the great Danish fairy tale author, Hans Christian Andersen. Málaga harbor, lighthouse and Moorish Alcazaba fortress (middleground). Photo by Gerry Dawes©2006. Commissioned in 2004 for the 200th anniversary of the author's birth by the Danish Royal Family, the Statue of Hans Christian Andersen is a work in bronze by sculptor José María Córdoba and is located in the Plaza de la Marina de Málaga. Andersen visited Málaga in October of 1862 and loved the city. You can sit beside him on the bench and peek into his bag, which contains The Ugly Duckling. Photo by Gerry Dawes©2006. Augmenting the city’s historical treasures, Málaga, in just a little more than a decade has become a serious art museum attraction with the Picasso Museum (opened in 2003), the Casa Natal de Picasso (the artist’s restored home of his youth), Museo Carmen Thyssen (a collection of more than 200 paintings from the collection of the Spanish baroness who owns many of the paintings at the Museo Thyssen-Bornemisza in Madrid), el Centro de Arte Contemporáneo, Centre Pompidou Málaga (the only branch outside of France), the Colección del Museo Ruso (believe it or not, an outpost of the State Russian Museum collection in St. Petersburg), and a burgeoning artsy neighborhood called SOHO next to the port contribute to the city’s now considerable cultural attractions. Sign on a bus stop in Málaga, advertising the then relatively new Picasso Museum, which opened 2003 and has been a major draw for tourists ever since. Photo by Gerry Dawes©2006. Spaniards have a saying, mejor tarde que nunca, better late than never. Late my re-discovery of Málaga may be, but I plan to make up for lost time and put this magical city high on my agenda for future visits. Spanish draft cerveza and habitas con jamón (baby faba beans with serrano ham) at Restaurante El Chinitas in Málaga. Photo by Gerry Dawes©2006. ABaC and Three-star Chef Jordi Cruz from Gerry Dawes on Vimeo. Congratulations to my great friend Chef Jordi Cruz Mas for receiving his third Michelin rosette at Restaurante Hotel ABaC in Barcelona and to Chef Angel León, a genius with seafood dishes at A Poniente in El Puerto de Santa María, who also was awarded a third rosette. Chef Jordi Cruz Mas in his kitchen at Restaurante Hotel ABaC in Barcelona. Chef Angel León, a genius with his embutidos del mar, seafood charcuterie, at A Poniente in El Puerto de Santa María. Photograph by Gerry Dawes©2017. 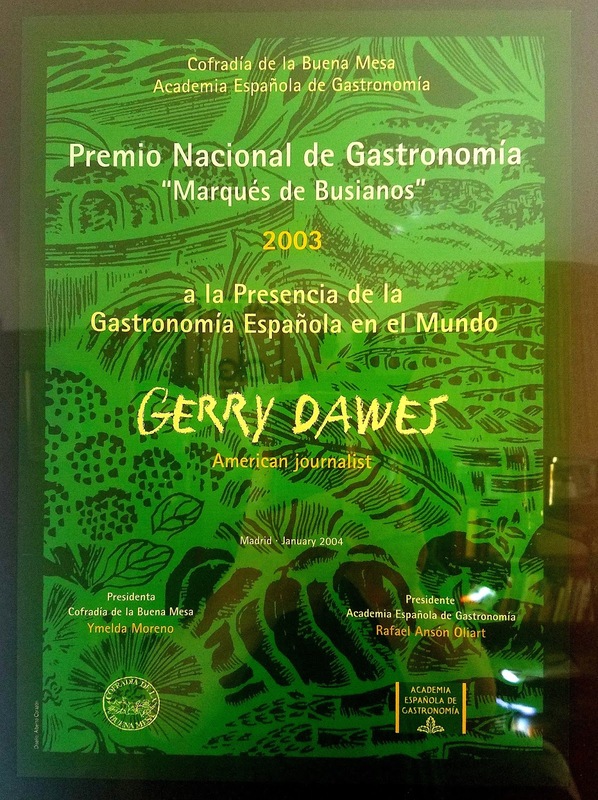 I am no fan of Michelin, for a lot of good reasons, not the least of which is that they have been screwing their gastro-tourism rival Spain for many years by not awarding Spanish restaurants the rosettes so many of them so richly deserve. However, I know what this means to both Jordi Cruz and Angel León and I know how hard they both worked to reach this goal and how well deserved this award is in both cases. I have been following Jordi Cruz Mas since he was at Restaurante L'Angle in Manresa, where he was doing brilliant and delicious (always) food. Chef James Campbell Caruso at his restaurant La Boca in Santa Fe, New Mexico. Persistence of Memory* (Salvador Dalí) Four-Watch Rating. A return to La Balconada for the second time in three months, this time it was Kay and I with my good friend John Sconzo (Docsconz: Musings on Food and Life and his son and equally good friend, L. J. (Ele Jota). Alcachofas con jamón, La Balconada on La Plaza Mayor of Chinchón. Photograph by Gerry Dawes©2010. Contact gerrydawes@aol.com. Our steak, pieces of which were cooked over a super-hot piece of stone center table, La Balconada, Chinchón. Jan. 25, 2014. 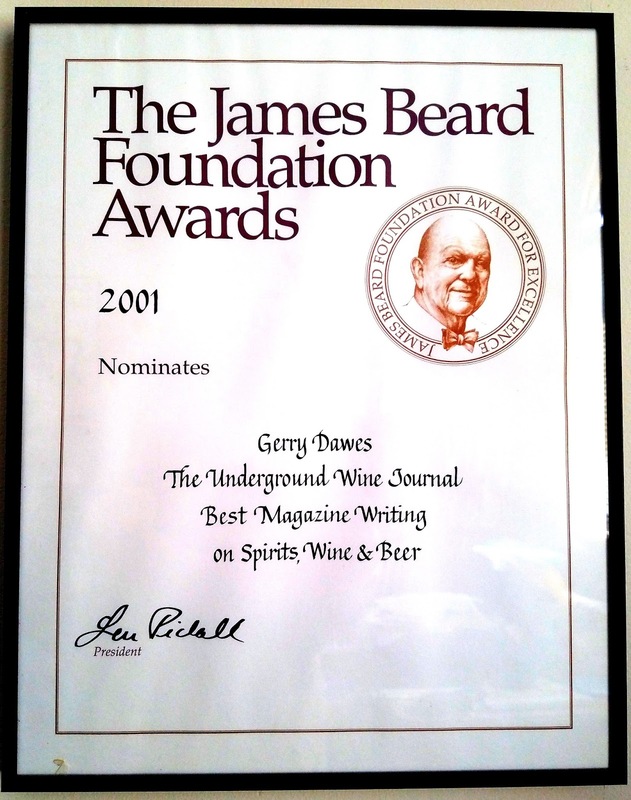 Photo by Gerry Dawes©2014 / gerrydawes@aol.com / Facebook / Twitter / Pinterest. Canon 5D Mark III / Tokina 17-35mm f/4. After-dinner Anís Chinchón Dulce (and Anís Chinchón seco) with Manuela’s arroz con leche and leche frita, two classic Spanish desserts at La Balconada, Chinchón. Jan. 25, 2014. Photo by Gerry Dawes©2014 / gerrydawes@aol.com / Facebook / Twitter / Pinterest. Canon 5D Mark III / Tokina 17-35mm f/4. Manuela Nieto, chef-owner of La Balconada, Chinchón is one of the best cooks in Madrid and Castilla-La Mancha. Jan. 25, 2014. Photo by Gerry Dawes©2014 / gerrydawes@aol.com / Facebook / Twitter / Pinterest. Canon 5D Mark III / Tokina 17-35mm f/4. Kay Balun, Chef-owner Manuela Nieto, her husband and director de la sala, Isidro Olivar, John Sconzo (Docsconz: Musings on Food and LIfe) and L. J. Sconzo at La Balconada, Chinchón. Jan. 25, 2014. Photo by Gerry Dawes©2014 / gerrydawes@aol.com / Facebook / Twitter / Pinterest. Canon 5D Mark III / Tokina 17-35mm f/4. 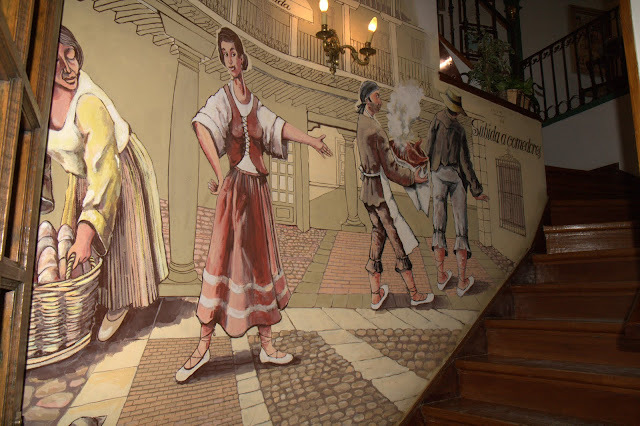 Mural in the stairway to the entrance to La Balconada. Manuela Nieto is one of the best cooks in Castile. Her alcachofas con jamón, artichokes cooked with Ibèrico ham; her huevos rotos con patatas, broken eggs over fried potatoes with a touch of vinegar; gazpacho; alubias con almejas, beans with clams; grilled asparagus and many other dishes are second to none. 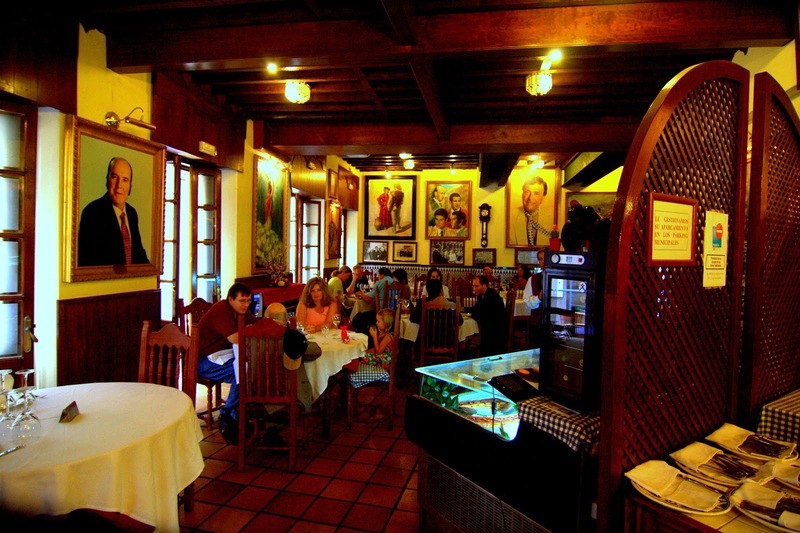 This is a serious, elegant, classical restaurant in a very charming, but touristy town. Chef-owner Manuela Nieto Recio and her husband Isidro Olivar of La Balconada.